We’re back in the studio after our three-month road trip, trying to pick up the threads of what was as an intensive three-week recording session back in June. The last thing I did in the studio before we left was to re-record harmonica tracks with a new, $55 Hohner E harp. I use harmonicas a lot when we perform live, playing the instrument with a rack around my neck. The cheap harps I normally use did not stand up to scrutiny in the confines of a studio. The humble mouth harp was given credence 84 years ago when a fellow called Larry Adler saw an advertisement in the Baltimore Sun for a mouth organ band. Adler went to the audition and a grand career was born. He worked with the likes of Fred Astaire, Dizzie Gillespie and George Gershwin. Vaughan Williams composed music for him. A jazz musician from the same era, Max Geldray, was a pivotal part of The Goon Show. He provided musical interludes and the closing music for at least 160 episodes of that madcap radio programme. I was thinking about Max, who died in 2004 and Larry (in 2001), as they were without a doubt the people who helped me overcome shyness and make use of my natural musical ear to embark on a journey which, 55 years on, is still bringing me joy, even if my neighbour’s dog howls when I play harmonica. I’m a lazy player, quickly inventing instrumentals to add colour to my songs and I clearly don’t practice as much as some of the people in the videos at the end of this essay. But I’m happy to report that my harmonica tracks survived the cut. I did my three tracks in a couple of takes. We got it done quickly because I know the stuff backwards, but also with my new hearing aids, I can hear snails sliding across the studio’s tin roof. My laziness extends to the maintenance of my harps. When a great blues harp player, Matt Moline, came to the studio to add harmonica to one track on our first CD, he had a very large number of instruments encased in a soft travel pack. We got on to the subject of cleaning them and I confessed I had never done that. Matt got that look on his face that you see when nurses are gowning up to go into the infectious diseases ward. The radio was our only entertainment in those days, so there was lots of time to learn things that require hours of practice, like knitting, embroidery, 1,000-piece jigsaws or learning to play the spoons. I was always coming second in talent quests, usually to a comely lass with a guitar and a sweet smile. Once shunned as a toy instrument for the poor, the humble 10-hole diatonic harmonica has progressed to become a mainstay of contemporary rock, folk and blues music. There are great players who have gone on to play harp in the choir invisible (Sonny Terry, Little Walter, Big Mama Thornton), and a good few who are still with us, including Australian players Chris Wilson, Doc Span and Jim Conway. Charlie Musselwhite is lauded by some, as are Charlie McCoy, Christelle Berthon and Stevie Wonder. Stevie learned to play when he was five and invented a completely distinctive style. And (OMG I didn’t know this), Billy Joel played harmonica on “Piano Man”, inspired by Bob Dylan using a rack to play guitar and harmonica at the same time. The less said about “Piano Man” the better. I prefer Weird Al Yankovitch’s “Sling us a web; you’re the Spider-Man”. You can spend $250+ on a chromatic harmonica (it has a slide which enables you to play sharps and flats). You need two, in different keys, to cover the complete range of anything you might like to play (William Tell Overture, Night and Day, Clare De Lune). 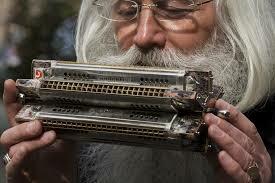 But most players today use diatonic, 10-hole blues harmonicas. They have a small range of notes and lack of sharps and flats, so in theory there is a limit to what you can play. I use a cheap set of seven Hohner harmonicas bought from the Internet for $99. They are what you think they might be! I have some old harmonicas I paid a lot of money for (Lee Oskars) and they are still better than the new ones in the box set. You can pay upwards of $85 for a quality Lee Oskar, although you’ll find them cheaper on the Internet. Those of you obsessed with music trivia already knew this, but Lee Oskar is a Danish musician and harmonica manufacturer who featured in Eric Burden’s band War and performed in Cheech and Chong’s “Up in Smoke”. People who don’t know how to do it think that being able to play guitar, sing and play harmonica at the same time is one of the dark arts. All you need to do is put a rack around your neck, insert the instrument (the right way up), keep a steady tempo going on the guitar, and save some breath for singing. Kath Tait, a Kiwi who lives in London, has a special way of playing the concertina and a harmonica in a rack while singing. The harmonica bits happen in the instrumentals, but I guess you’ll figure that out. 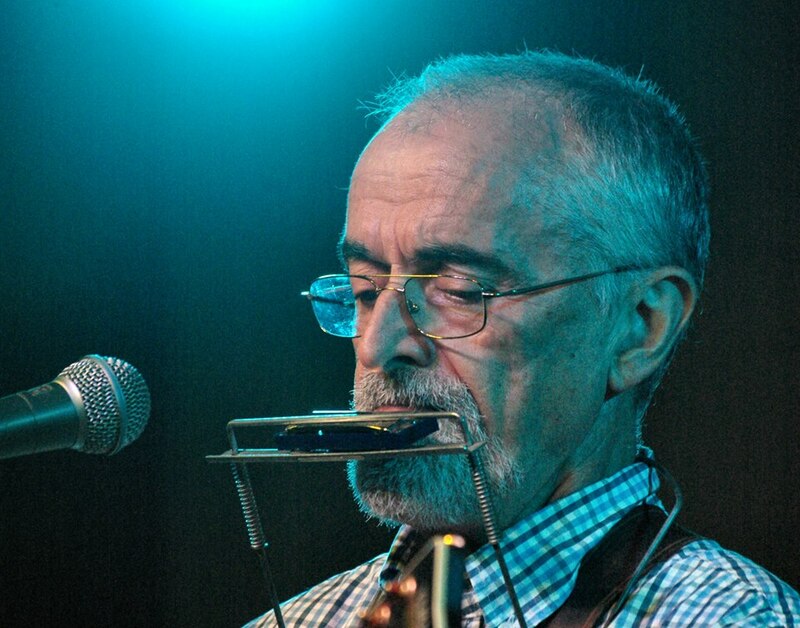 Kiwi expat Brendan Power, now domiciled in the UK, is a harmonica virtuoso who manufactures, repairs and tunes harmonicas. He uses a loop pedal and other gadgets to put on a one-man show, but is still heard to best effect jamming with other musicians. Delbert McClinton: He played harmonica on Bruce Chanel’s “Hey Baby” (1961), and (the story goes) gave young John Lennon some pointers backstage when the Beatles supported Chanel on a UK tour; thus “Please Please Me” and “Love Me Do”.